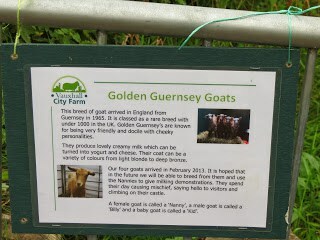 London is highly metropolitan – but over and over again since moving here I’ve run into something that never fails to pleasantly surprise me: farm animals! Whether it’s stumbling upon live fowl at a farm shop, or meeting a rather dashing hog gentleman on an urban farm near the financial district, by now I probably should have learned to not be shocked at where they turn up. But I’ve got to confess, the last place I really expected to overhear, “Can we go see the goats?” was walking along the Thames on my way to Big Ben! London’s Southbank Centre is a cluster of buildings devoted to the arts, famous particularly for the music festivals and performances that go on in most of its five main buildings. 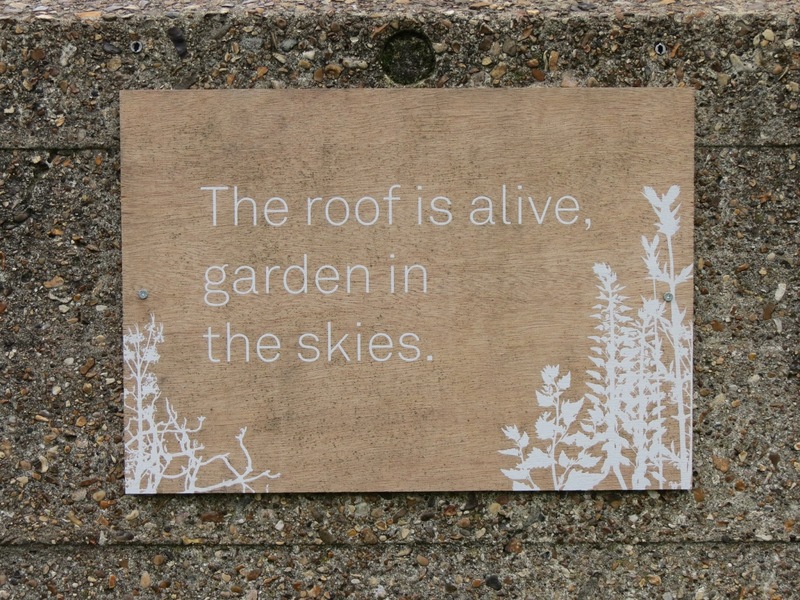 Additionally there are shops, restaurants, cafes and open areas … including (I discovered!) 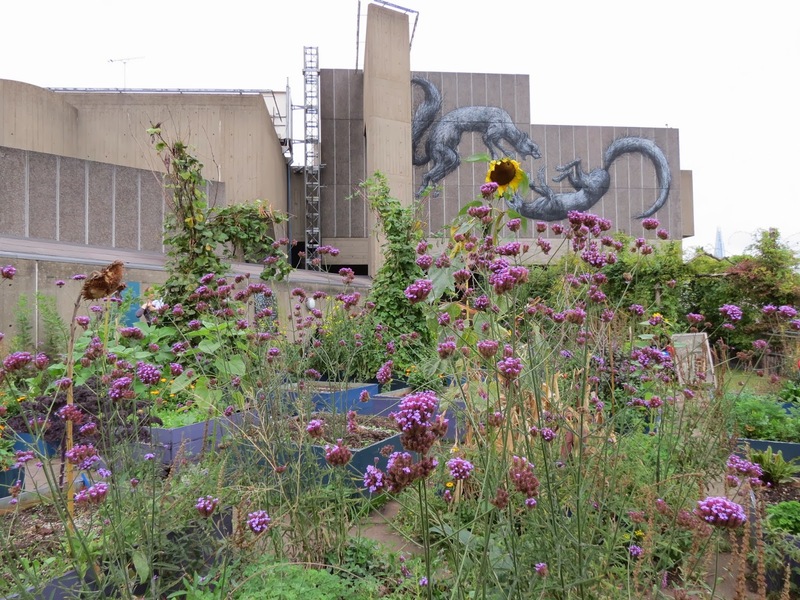 a rooftop wildflower “meadow” atop the Queen Elizabeth Hall. 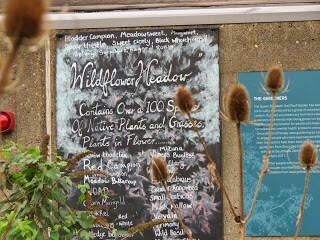 The meadow is utterly open to the public. Just climb some stairs from the riverside walk and suddenly you’re in a secret garden in the very heart of Britain. 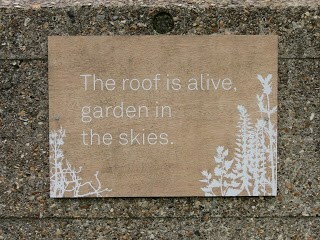 And wandering amid the shrubs, beds, and brambles? 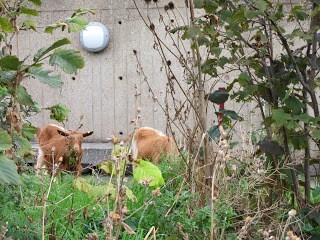 Goats, specially brought in by Vauxhall City Farm for the day! 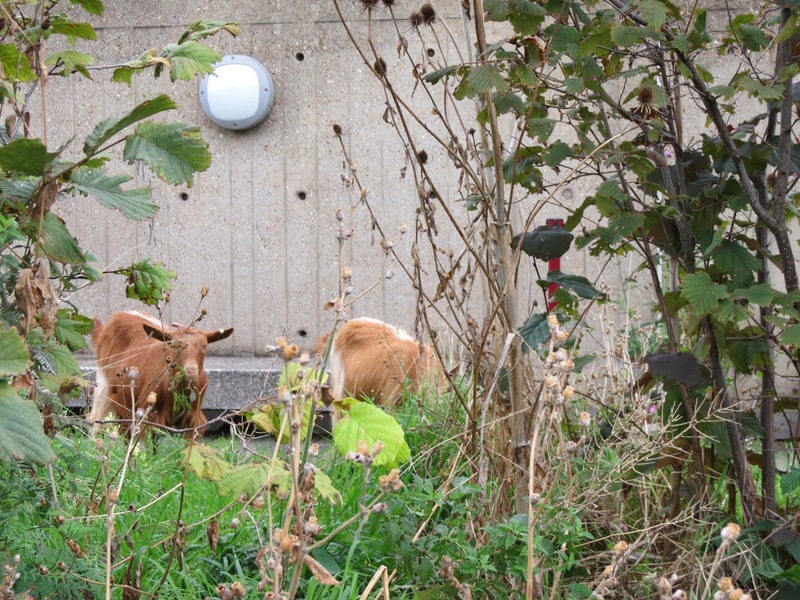 According to the team, using animals to graze down the meadow is an attempt to keep the plant and grass renewal process as close to natural as possible, and this goat-y visit is a regular event. 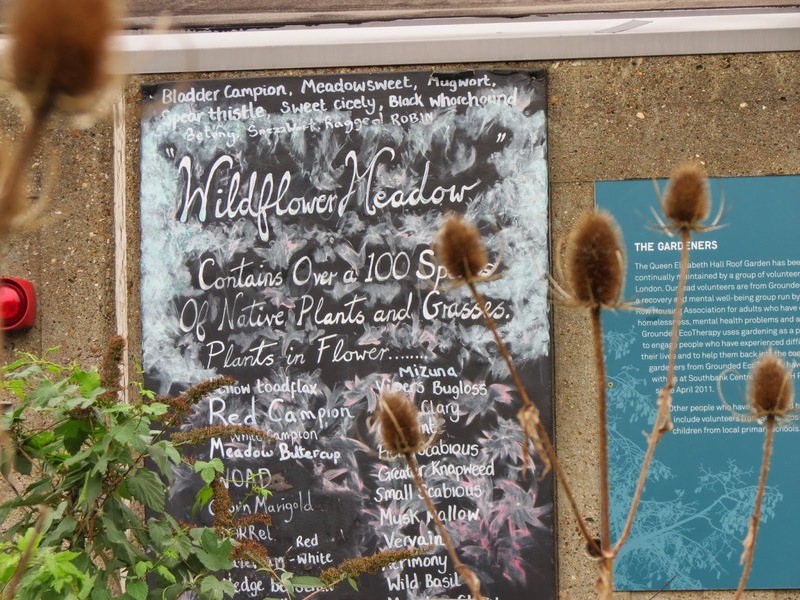 They make a day of it by including refreshments for visitors, offering seeds from the flowers and plants cultivated in the meadow, and offering workshops for children and gardeners alike. Vauxhall had sent along one of their handlers to answer visitor questions, and the garden had many placards with facts (just like Deborah’s “Did You Know…” series!) 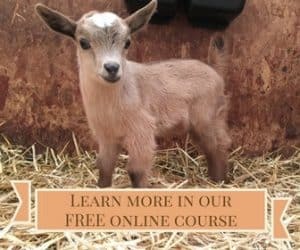 about the goats’ breeds, life cycle, habits, and care requirements. 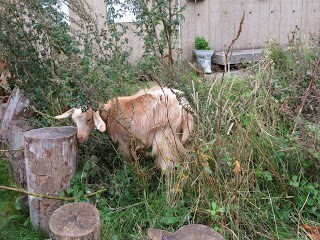 It wasn’t a petting zoo and interactions with the animals were limited, but it was really fun to see the goats doing … well … what goats do! Behaving as working livestock, even if just a 15 minute stroll away from the Houses of Parliament. 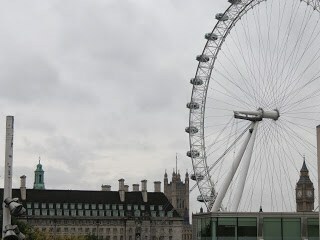 This is the view from the garden! 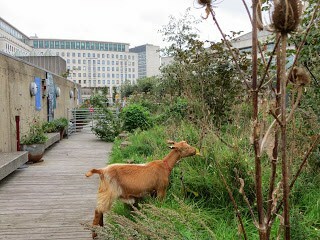 Time and again, I’m finding out that the lines between metropolitan and agricultural can be pretty fuzzy here in London. I think some people who don’t own livestock (like myself) don’t always appreciate that most domesticated animals have been bred over thousands of years to do a certain job and take part in certain natural cycles. 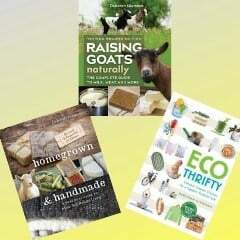 They don’t exist to be petted or admired as pets, they are working animals and ideally we have a mutual relationship. Here, these goats weren’t just getting what I imagine was a pretty tasty meal, the meadow keepers were maintaining the area in a natural way (very much in keeping with their ethos) while getting some much needed maintenance work done almost totally organically.